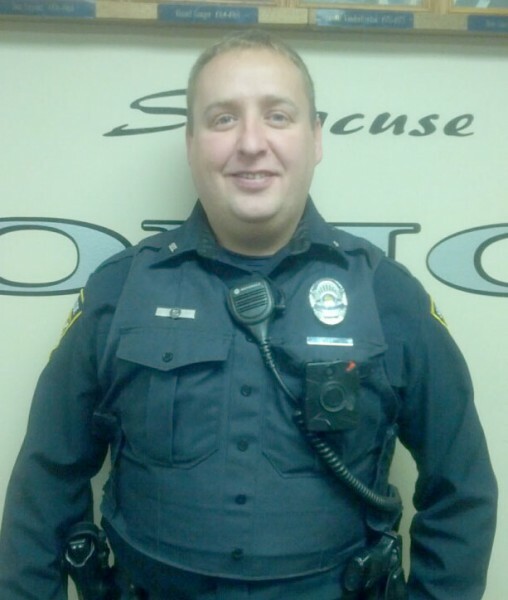 Syracuse Town Council learned Tuesday evening during its regular monthly meeting the Syracuse Police Department now has 10 body cameras for officers and training began Wednesday (today). Police Chief Tony Ciriello reviewed some of the guidelines for the body cameras, notably they aren’t allowed to be on in rest rooms, hospitals or doctor’s offices unless a crime is being committed due to privacy issues and laws. 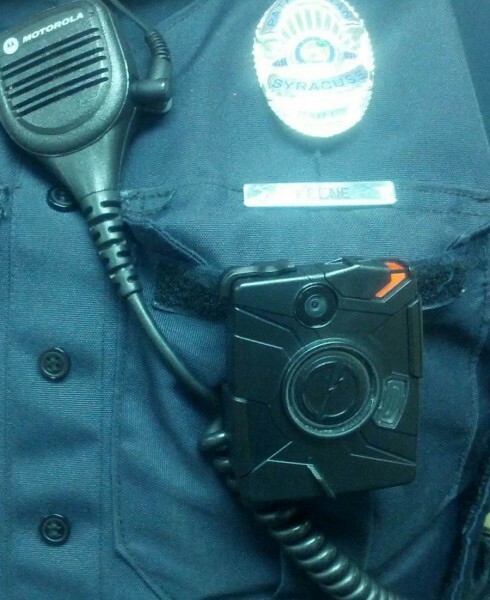 Syracuse Police Officer Joe Keene displaying the new body cams purchased by Syracuse Police Department. Councilman Larry Siegel noted the department has three cars with more than 100,000 miles on them. He asked Ciriello what his plan is for the cars. Car No. 9, a Dodge Charger, recently had its engine rebuilt and is considered usable for quite some time. Car No. 10 is slated for replacement in 2015 while Car No. 7 is considered a reserve car and doesn’t get much use. Jeremy Sponseller, public works superintendent, presented the 2015 water and wastewater budgets. With just the operating expenses the budget would see a 1 percent increase, however with the change to radio meters the increase is about 12 percent. Sponseller said he wanted most of the meters changed out to radio meters in 2015. In the wastewater budget there will be a 5 percent increase due to inflation and aging infrastructure. The council approved both budgets. Julie Kline, clerk-treasurer, reported the town’s 2015 budget is $118,149 under max levy. The levy for 2015 will be .0918 while in 2014 it was .0940. Kline reviewed the insurance renewals for property liability and equipment renewal. The increase was $4.4 percent while the town budgeted for a 5 percent increase. The health insurance renewal for the town saw an 18.09 percent increase over 2014, however enough was budgeted to cover for it. The council approved the insurance renewals. The council also approved the following appointments for 2015: Town Manager, Henry DeJulia; Police Chief, Tony Ciriello; Town Attorney, Vern Landis; park department appointments, Mary Hursh; Syracuse Redevelopment Commission, Larry Siegel, Henry DeJulia, Paul Stoelting, Dan VanLue and Ernie Rogers; Tree Board, DeJulia and Chad Jonsson; Board of Zoning Appeals, Jim Allegret and Stoelting will be the council president for 2015.